All transactions are safe and secure with a reliable history in online purchasing behind each of our associates. 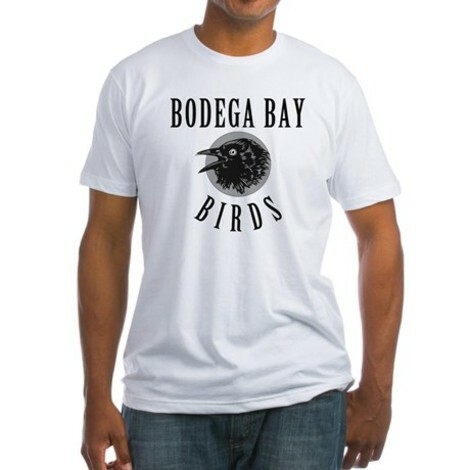 Buy the Bodega Bay Birds t-shirt to own Alfred Hitchcock clothing and merchandise. This school team style design lets everyone know that you root for the Bodega Bay Birds. Like the vicious creatures in the Alfred Hitchcock Birds movie, members of the Bodega Bay Birds can be a bit relentless too, especially when it comes to winning. Wear this fun design as a tribute to one of Hitch's best films. Chirp like an angry bird to cheer on the would be team. In addition to the Bodega Bay Birds tee above, browse the Alfred Hitchcock Clothing Gallery for more apparel like men's and women's clothes, kids shirts or hoodies.